The White House was put on lockdown yesterday after a man on a mobility scooter set himself on fire outside the North Lawn. The as-of-yet unidentified male, who is said to suffer with mental health issues, set his jacket on fire after arriving on the North Lawn on Friday afternoon. The Secret Service and law enforcement were quick to arrest him and attend to what they called a ‘police/medical incident’. A male subject operating an electronic wheelchair-type scooter lit his outer jacket on fire while sitting along Pennsylvania Ave outside the North Fence Line. Uniformed Division Officers immediately responded, extinguished the fire and rendered first aid. The male subject has been transported to a local hospital with what appears to be non-life threatening injuries. While the man was said to be of no threat to President Donald Trump, who was in the White House at the time of the incident, NBC Washington reported a suspicious package was found close-by to the site of the fire. The package is being investigated by the D.C. Fire Department. The incident occurred shortly after Trump spoke in the Roosevelt Room about the nation’s 5G network and the smoke could reportedly be smelled in the West Wing. The man is now being treated in hospital for injuries which are said not to be life-threatening. He received treatment while in Secret Service custody. 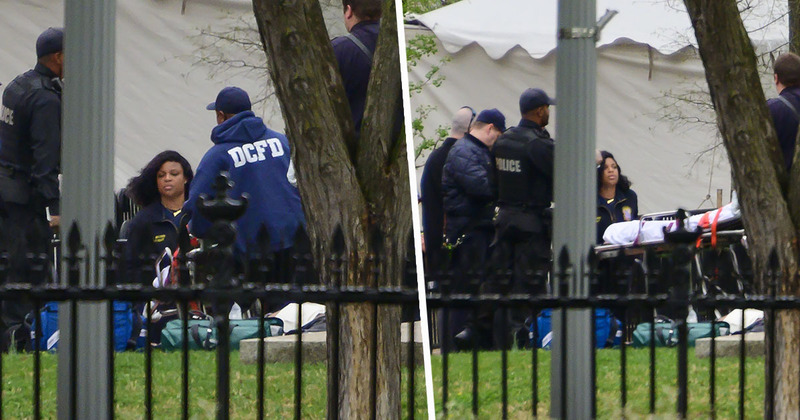 The North Lawn of the White House, Lafayette Square and the sidewalk in front of the White House were closed by the Secret Service cleared during the investigation.